Oceanic heatwaves have increased by 54 percent since 1925, posing a major threat to aquatic ecosystems. In a study published in the journal Nature Communications, researchers outlined the cause and effects of underwater heatwaves and their future impact on the world’s oceans. According to researchers, “These trends can largely be explained by increases in mean ocean temperatures, suggesting that we can expect further increases in marine heatwave days under continued global warming.” As higher levels of greenhouse gases concentrate in the atmosphere, greater amounts of solar radiation are trapped on Earth — 95 percent of which is absorbed by the ocean. Much like the relationship between extreme weather and rising temperatures on land, as the mean average oceanic temperature rises, so too does the likelihood of extreme oceanic heating events. Because water is able to hold more heat than land, these extreme temperature events last longer than those caused by higher air temperatures. A recent example occurred in 2015, when ocean temperatures from Mexico to Alaska increased up to 10 degrees above average. Fifty documented whale deaths were recorded in this period, and many other marine animals suffered from the unusually hot water. To conduct the study, the research team gathered and analyzed data on sea surface temperatures from the past century, with recent decades producing the most accurate data. 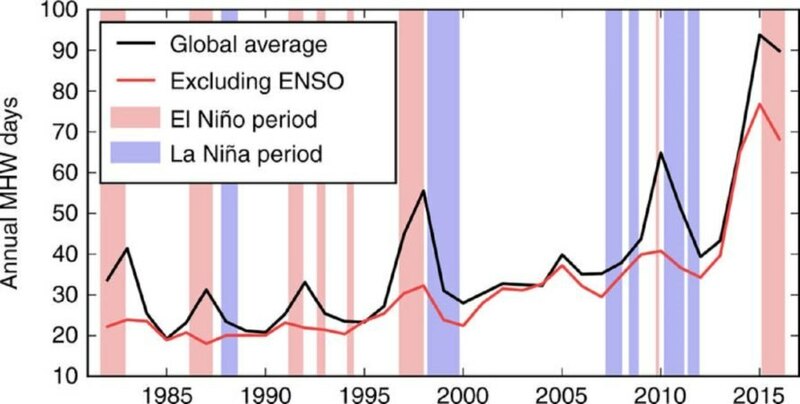 Given that the most useful data is from such a short time period, the team could not explicitly draw a causal link between anthropogenic climate change and oceanic heatwaves. They explained that the fluctuations may be due to natural temperature swings. Nonetheless, the researchers concluded that the notable increase in average oceanic temperature is absolutely affected by climate change. The scientists are most concerned that — in combination with other pressures such as acidification, overfishing, and pollution — fragile ecosystems could reach a tipping point by oceanic heatwaves and ultimately collapse. Images via Depositphotos and Oliver et al. Oceanic heatwaves have increased by 54 percent since 1925, posing a major threat to aquatic ecosystems. This chart demonstrates oceanic heatwave data over time. Scientists are most concerned that fragile aquatic ecosystems could reach a tipping point by oceanic heatwaves and ultimately collapse.